Fr. Gobbi has requested that we share his annual letters with all MMP members. Those on our official mailing list have already received a packet that included Fr. Gobbi’s 2009 letter, both in English and Spanish. I am making it available on our website for the benefit of those who have not officially registered as members, and also for any on our mailing list who failed to notify us of their address changes. My accompanying letter is copied below and includes a link to access the transcript of the talk that Fr. 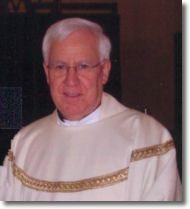 Gobbi gave during the cenacle in Miami on January 18, 2009. I am pleased to share with you Fr. Gobbi’s annual letter for 2009, and pray that you will take the time to meditate upon it. I also invite you to share it with your family and friends, since it can serve as a wonderful means of introducing the Marian Movement of Priests to others. The theme of his letter – suffering and sharing in the passion of Jesus and of his Church – is very apropos. The world and the Church are in great turmoil, and humanity is carrying a heavy cross. We know, however, that this time of purification must necessarily precede the Second Coming and Eucharistic Reign of Jesus when at last we will see the New Heavens and the Renewed Earth. Fr. Gobbi in the U.S.
We had the great privilege of welcoming Fr. Gobbi to the United States this past January. At the beginning of each new year, he travels to South America to hold cenacles in the various countries of that great continent. This year, he accepted our invitation to stop in Miami for a few days, during which time he conducted a cenacle for the laity on Sunday, January 18th, and one for the clergy on the 20th. I wish to thank the pastor of St. James, Monsignor Jean Pierre, who has always been very accommodating in allowing us to use his beautiful church. I also extend my heartfelt gratitude to Fr. Richard Soulliere, the M.M.P. regional director for the entire state of Florida, and also to the many lay members who assisted him, for all their hard work in planning for this event. (3) Spreading devotion to Our Blessed Mother by means of the cenacles of prayer. This year’s spiritual exercises will be held from June 28 to July 4, again at the Shrine of Merciful Love in Collevalenza, Italy. All bishops, priests, deacons and seminarians are invited to attend. If interested, please notify me at soon as possible so that I can forward you all pertinent information and registration forms. I am grateful for your continued prayerful and financial support. Our Lady relies solely on the generosity of you, her children, to introduce and spread her messages to so many others. May you be abundantly rewarded. We are recognized by the IRS as an organization described in section 501(c)(3) of the Internal Revenue Code; therefore, your gifts are tax deductible. If you wish to name the Marian Movement of Priests as a beneficiary in your will or trust, please call for our tax identification number. I would be remiss if I didn’t say a few words about the situation in which our country finds itself. We are in the throes of a turbulent storm, the forces of evil thrashing us about. Why is everything around us collapsing? It is because we have not listened to Our Lady. She warned us that, precisely because we “continued to walk along the way of rejection of God and of his Law of love”, this country would know “the hour of weakness and of poverty, the hour of suffering and defeat…” (cf. 437 f-g) So what is the remedy for our present woes? The answer is to follow God’s law, the same law upon which our Constitution was founded. IT’S THAT SIMPLE! If we inject this country with a “spiritual stimulus”, then our problems will be resolved. God takes care of those who love and serve him. And of course, we must pray for the conversion of so many of our fallen-away brothers and sisters. They are being swept away by a flood that is inundating their souls, and we must come to their rescue with the life raft that the Blessed Mother offers us – the cenacles of prayer. In our cenacles, we have to pray for the conversion of all – that their eyes will be opened and they will realize that these problems cannot be solved by purely human means. We must put government back into the hands of God. Bring the Ten Commandments back to where they belong, for all to see and follow. Respect life in all its forms. Then God will reward us all with his gifts of peace and prosperity. I encourage you to write or call to obtain the booklet, “The Spiritual Power of My Cenacles.” The suggested donation is $3. We also have an ample supply of the cenacle guides. At the moment, our stock of the book, “To the Priests, Our Lady’s Beloved Sons,” is depleted. We have encountered numerous delays in our preparations for a reprint, but do hope to have more books available by June. Your understanding and patience are appreciated. We know that many no longer receive our mailings because they have moved. If you know of any members, perhaps in your cenacle, who have not received this letter, then please invite them to send us their change of address. I take this opportunity to wish all of you a holy season of Lent, and a joyous and blessed Easter. Be firm in your faith because, as Christ promised, he WILL come again!